A prototype of Lavazza's and Argotec's "ISSpresso" produces fresh-brewed Italian espresso. A final version of the coffee machine will operate onboard the International Space Station. The so-called "ISSpresso" machine is expected to launch to the station aboard Orbital Sciences' fifth resupply flight using the Cygnus spacecraft and Antares rocket in early 2015. And once it's installed, astronauts will only need to push a button to get coffee. "The design and the entire system was built from scratch, because [compared to] a regular coffee machine working on Earth, there are a lot of safety requirements," said David Avino, the managing director of engineering and software company Argotec. Lavazza, an Italian coffee maker, also participated in the design. Those requirements included finding a way to keep the hot water inside the machine after the espresso is finished. While water residue is normal in Earth-bound espresso machines, the prospect of boiling-hot bubbles seeping from the device in microgravity forced Argotec to seek a solution. Argotec has kept its exact solution under wraps as the company applies for patents, but in general terms, a small container in the machine collects the water. Also, stainless steel has replaced the usual plastic tubing inside the device, making it more resistant of pressures of up to 400 bars. Argotec partly bills the device as a tool for the astronauts, but also a way for the company to experiment with designs that could improve coffee drinkers' lives on Earth. Astronauts will be able to watch the foam being applied inside the machine, for example. 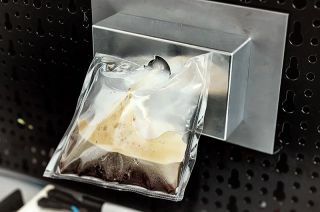 The company is also interested in how the coffee brewing performs in microgravity, as the makers haven't had the chance to test that out yet. The ISSpresso space coffee machine possesses dimensions of 17 by 16.5 by 14 inches (43 by 42 by 36 centimeters), and weighs in at 44 pounds (20 kilograms). Astronauts can operate the device with only the push of a button. An astronaut will take a pouch of water from the station's room-temperature potable system, about 8.4 ounces' (250 milliliters) worth. Those who like sweet coffee can add a dash of sugar to the mix. Next, crew members will select how much coffee they want, insert a capsule in the top of the machine and press "brew." It takes the device 60 seconds to heat the water to 167 degrees Fahrenheit (75 degrees Celsius), then 40 seconds to dispense the espresso. The coffee will spew out into a pouch, ready for the astronaut to drink. And if there's a lineup, the company says the machine can easily make a second serving in the same time, about 40 seconds. ISSpresso is in final testing right now, but if all goes to schedule it should be available on the International Space Station in time for the Expedition 42 flight of Samantha Cristoforetti, a European Space Agency astronaut from Italy. She is expected to go to space in November. "How cool is that?" Cristoforetti wrote on Twitter. "I'll get to operate the first space espresso machine!"